Cruise lines have managed to take a 2,000 room hotel, make it float, and added theaters, dining rooms, waterslides, and more. But while the ships are a marvel, what no cruise line will ever do is be able to control the weather. And while you may think nasty thunderstorms and hurricanes are the big threat to the cruise lines, it’s actually something much calmer that causes the biggest headaches — fog. Fog is a cruise ship’s enemy. While underway the ships are equipped with the latest radar technology to make their way through. However, when it comes to porting, fog can cause huge delays. If the fog is too heavy, then the cruise ship can’t always dock. That means the passengers already on board won’t be able to disembark and the passengers waiting to start their cruise can’t board the ship. It puts everything behind schedule as the ship waits offshore for the fog to lift. If your ship is delayed by fog, the most important thing is to keep patient. Remember that even in good weather 3,000-plus passengers have to get off the ship, the liner has to re-supply, and 3,000 new passengers have to check-in and board the vessel. Bad weather only makes it more difficult. Furthermore, the cruise lines want to stick to their schedule just as much as you do, but there is only so much that they can do if fog takes over. Safety of the ship, crew, and passengers takes highest priority. What the cruise lines do try to do is stay in contact with passengers. Since they have your contact information from your booking, they will often send emails or text messages to keep you up-to-date on the situation. 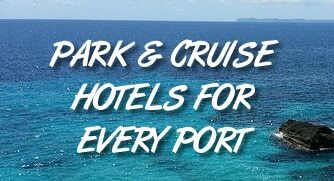 In addition, you can always call the cruise line or visit their website for updates. Often they will ask that embarking passengers stay clear from the port until asked to come board. Doing so helps to alleviate the traffic jams that can occur from a delayed schedule. But what about the cruise? What happens to the schedule if there is a delay? If the delay is short enough (a few hours) then the cruise can usually make up for lost time by sailing a little faster. However, with longer delays the itinerary may be rescheduled. Longer delays can mean a slight change like re-ordering the ports visited, all the way to skipping some stops altogether or even cutting days off the cruise. We’ve heard of five-day cruises being turned into three-day trips. “Because of its delayed arrival and subsequent delayed departure, Carnival Ecstasy will now sail on a modified three-day cruise that will return on Thursday, Feb. 24 (originally, the ship was scheduled to sail on a five-day cruise to Cozumel and Progreso operating Saturday to Thursday). “Guests have the option of canceling and receiving a full refund, a 25 percent discount off a future two- to five-day voyage and a $45 per person meal allowance. Guests who opt to sail on the modified three-day cruise will receive a 50 percent refund of their cruise fare, a 50 percent discount on a future two- to five-day cruise, and $45 per person meal allowance in the form of a shipboard credit. If delayed a shorter time period, we have heard of cruise lines offering small amounts to guests’ onboard accounts once they are on the ship. The main thing to remember — don’t get flustered. The cruise line will do everything in its power to get you on board and on your trip as soon as it can.